Merganser's Radar O'Reilly MH, WC was an exceptionally handsome son of Merganser's Classic Matlock. Radar lived to retrieve yet was a well mannered and socialized house dog. Radar was always happy no matter what the situation. He taught me some great life lessons. We miss the joy that Radar produced in our house. Radar's pedigree is half show and half field, the best of both worlds. Radar is a younger brother to our gorgeous retired female, Lieutenant Dish. 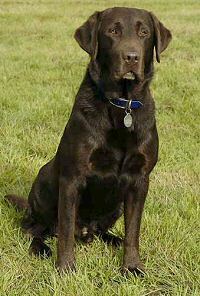 Radar received a Conformation Certificate at the 2007 National Labrador Specialty Show scoring a 26 out of a possible 27 points. Radar achieved his Master Hunter title at age three. Radar received a fourth place finish and several JAMs at the Qualifying level in field trial competitions. Radar also has a Working Certificate title. Radar weighs 78# and stands 22.5 inches at the point of the shoulder.